Every year since I was very young, I’ve volunteered at the Schenley Park Learn-to-Skate program that my skating club runs. Even for the four years I wasn’t skating, if purely because the entire rest of my family did it. Nearly every year, the program has had an experienced coach take on the role of program director. The program director’s job is to organize just about everything to do with the program, from creating name tags for students and coaches to tracking the finances to organizing everyone physically on the ice sheet during classes, and much more. Fortunately, just as in any business, the director delegates some of these responsibilities, but even so, it’s a very big job. This year, almost by accident, I was the one to take it on. My mother, who organizes how Schenley Park runs as a subsidiary of the Pittsburgh Figure Skating Club (our home club), couldn’t find anyone to be this year’s program director. Since she was swamped with other work, she managed only to delegate the marketing responsibilities. With two days until the first class, we were freaking out: we still didn’t have a program director, and fortunately for the club’s coffers but unfortunately for our sanity, our marketing person had done an astounding job, and we had literally twice our usual number of students signed up. Faced with this situation—twice the standard signup numbers, no program director in sight, and two days to deadline—my siblings and I were all given a prompt order to get everything ready. At first, it seemed it might be working, but eventually, between the sheer amount of work, the stress of trying to coordinate multiple people as efficiently as possible, and other miscellaneous factors, it became apparent to me that this wasn’t working. I evaluated the situation and decided the most reasonable plan would be for me to simply take everything over. I had the most experience with the system overall; and primarily because of my good handwriting, I was always the first choice for the largest task, namely, creating student name tags. Because of the color-coded system we used to group name tags by level, the process went something like this. First, large quantities of colored card-stock had to be precisely cut via guillotine and sorted. Then, the names of all hundred and twenty some-odd students had to be written with Sharpie onto the cards, and the cards had to be put into name badge holders. Finally, the cards had to be put into gallon plastic bags, sorted by level, and organized cohesively into large bins so that the volunteers could hand them out to the students on class day. For two days, I did nearly nothing else. 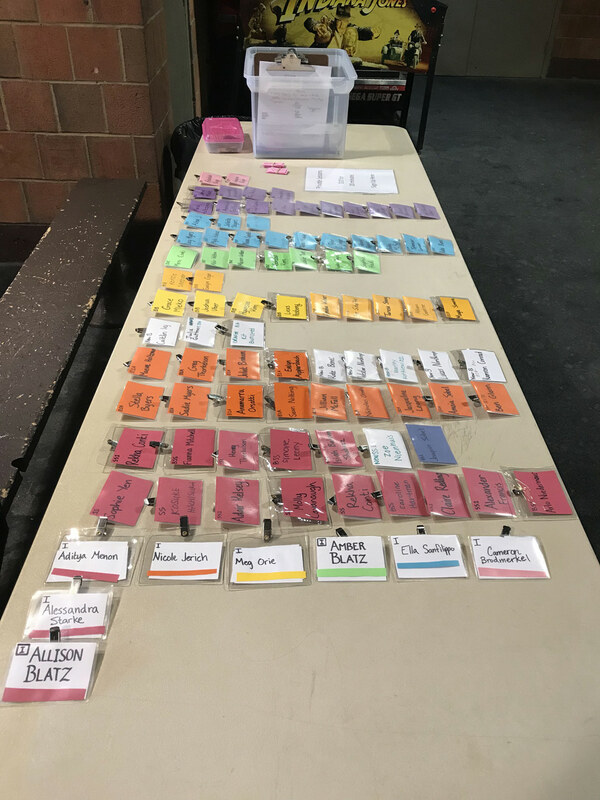 Not only did I do the name tags, but I also organized the student names and other information into a database, deposited all their checks, acquired cash for the concessions stand, and organized our volunteer instructors. Honestly, I’m very happy with how it all turned out. Everything was ready for the first class, my siblings and my mom didn’t have to worry about it, the kids and instructors got organized well, and the rest of the year ran pretty smoothly. On the day of class, since I knew everything about how everything had been organized, I also became kind of the go-to for volunteers with questions.